Last week I won a wonderful blog giveaway on Nikki McWilliams blog. I love Nikki's work - I mean what's not to like - tea, biscuits, textiles!! I would encourage everyone to have a look on her site, I have my eye on lots of her biscuity goodies! 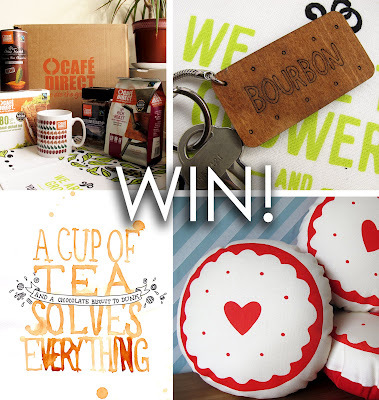 I won a hamper full of Cafe Direct tea, coffee, hot chocolate, a mug, a teatowel and most importantly a gorgeous print by Nikki, bourbon keyring and jammy heart cushion. 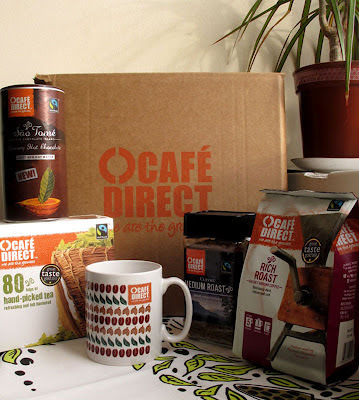 I have to say I dived straight into the hamper and love all the products, (I am currently very much in need of lots of caffeine!) the luxury hot chocolate is really yummy, and perfect topped with cream. Delilah loved the cushion, and it has already been put pride of place in her bedroom! That cushions is awesome! And I am LOVING delilah's little onesy! SOOOO cute!